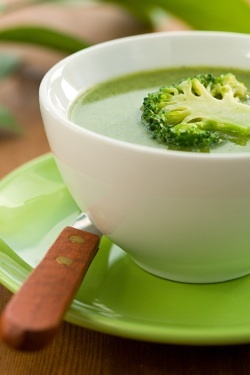 Another fantastic broccoli soup recipe! 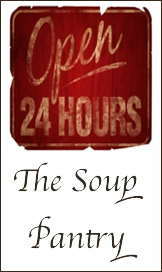 Here's a Broccoli Potato Soup Recipe with that holy grail combination. Delicious, nutritious, low fat, easy to make and tweakable for vegetarian and gluten free diets. It's dairy free too. A delicious soup that's low on fat and high on nutrition... and it's a snap to make. If you can wield a kitchen knife you can make this creamy soup. When our friend John left yesterday we brought home the fridge stuff that wouldn't last until he came back. Problem is that we have a tiny fridge on the boat and that means it's time to make soup. This time it was broccoli, potatoes and onions. A quick check of my existing supplies and I was able to find a recipe on allrecipes.com that I could adapt to to suit the materials I had available. We had it with a fresh baguette for supper last night and added a paste of powdered whole milk and water to make it super creamy (without adding too much liquid) for lunch today. Mmmmm. 1 Tbsp - Olive Oil. 1 Large - Yellow or white Onion chopped. 4 Cloves - Garlic chopped fine. 4 Cups - Fresh chopped broccoli or 2 - 10 oz pkgs frozen (thawed). 2 cubes - Knorr chicken bouillon. Heat Olive Oil in a 4 quart soup pot. Add chopped onion and garlic and saute until tender and fragrant. Dice potatoes and add to pot along with broccoli, cook for 2 or 3 minutes, 'til broccoli is bright green. Add water, bouillon cubes and herbs de provence stir well and simmer for 20 to 30 minutes, until vegetables are soft enough to be crushed against the side of the pot with a wooden spoon. At this point you can remove the contents to a blender and puree' until smooth or if you have a good stick blender you can use that to bring your soup to a creamy texture without using a drop of cream. * Experiment with seasonings like thyme, dill and curry. * Scramble fry hot Italian sausage and add to leftovers. * Add ham or bacon. * Top with blue cheese, grated parmesan or other cheese. * Use vegetable bouillon for vegetarian and vegan diets. * Use Gluten free bouillon for gluten sensitive diets. * Top with crunchy croutons. Products that we use (and like) for soup making and storing.